Protesters blocked off five major bridges in central London as part of a so-called "rebellion day". 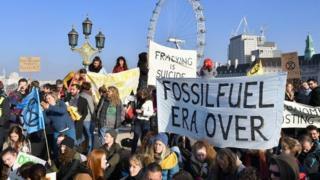 Organisers said thousands gathered in central London to demand the government take greater action on climate change. Demonstrators occupied Southwark, Blackfriars, Waterloo, Westminster and Lambeth bridges for most of the day, after a week of action by campaign group Extinction Rebellion. They later moved on from the crossings to a rally in Parliament Square. "We have tried marching, and lobbying, and signing petitions. Nothing has brought about the change that is needed." According to the group, 6,000 people joined the protests and more than 85 were arrested. Image caption The Met said the protests had caused "significant traffic disruption"
Two protesters on Westminster Bridge, who did not want to be named, told the Press Association they "truthfully believe we're all heading for extinction". "Climate change is so important, it's coming over so fast and nothing is being done," the women said. It is believed about 50 people have been arrested for taking part in action over the past week. The Met said the protests had caused "significant traffic disruption" and "hampered" emergency service vehicles from getting across London. On Wednesday, protesters glued themselves to the gates of Downing Street. At the start of the week, activists blockaded the UK's energy department by chaining themselves together on the pavement.